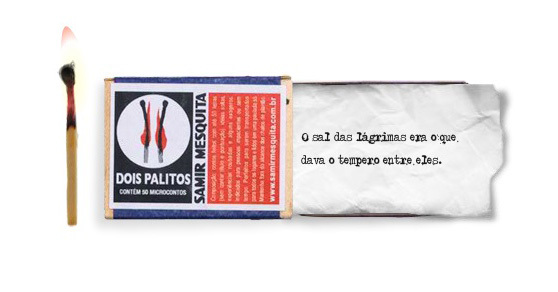 “Dois Palitos” (“Two matchsticks”) (2008) is the title of an e-poem by short story writer, Samir Mesquita based on “Two matchsticks,” a popular saying in Brazil. The origins of this Brazilian folk expression are difficult to determine, but its significance indicates the rapid execution of a task. The matchbox is a Brazilian’s old friend. Even with the absence of musical instruments several sambas have been created accompanied only by the cadenced rhythm of these improvised little rattles. Today, in the Internet and microblogging age, the matchboxes inspires new literary genres. Edited in print wrapped inside a matchbox, “Two matchsticks” is a small book with 50 short stories with up to fifity characters each. To promote an interaction with a digital sample of the book, the writer has created a Flash version with part of the short stories published, which does not disappoint the interactor. 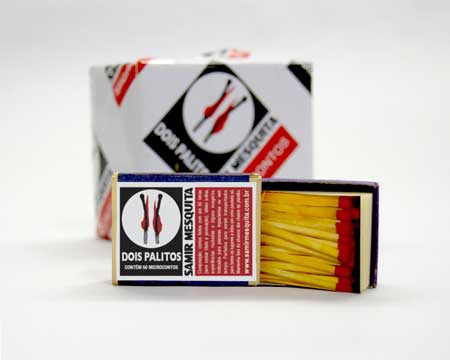 The digital version introduces the interactor a matchbox closed and to open it is necessary to click on the image. Inside the box are twenty new matchsticks. To read the short stories, the interactor should click on the matchsticks that come out of the box and after scratched it enter into combustion while the story is read. When all the sticks are burned, the box remains empty and to access the new matchsticks again, the player must reload the page. “Two matchsticks” by Samir Mesquita introduces short stories as the significance of this Brazilian expression that gives title to this small, but curious literary work. The tales tell us about ephemerality of life, family relationships and loving. Through a humorous irony, that at times approaches the morbid black humor, the storybook brings to the universe of literary, the atomized language of emerging dialogues of microblogging sites like Twitter, which restricts the body of the message to a maximum of 140 characters. “Two matchsticks” is a reflection of literary production in Twitter, which is already becoming an emergent literary genre in digital media. The Twitterature already have an organization led by Jean-Michel Le Blanc dedicated its research and publications, the “Institute for Comparative Twiteratura”, and is becoming more widespread among those writers who seek concise language to express this through the maximum of few words. It was time to take a jump in life. Chose to the window of the 10th. According to the Le Blanc’s Institute, twiterature’s literary influences are Japanese haiku poems, 19th century serialized novels, Surrealist exquisite corpse technique, and the OuLiPo. On the other hand, “Two matchsticks” can also be analyzed as a literary form that joins the past and present. The textual syntactic structure consists of two periods present in all stories, alludes not only to the economic text messages from Twitter, but also the couplets and adages, traditional forms of literature. In Brazil, popular proverbs and maxims are available in the most unexpected places such as public toilets doors and truck bumpers. It would not be surprising therefore that these contemporary couplets arise in matchboxes.